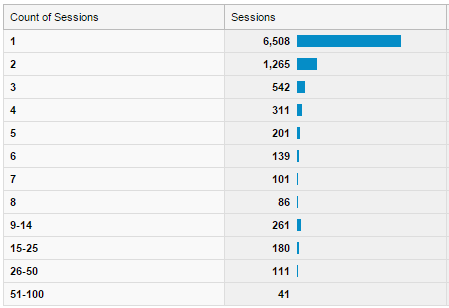 The Google Analytics report for Frequency displays a Count of Sessions dimension that is misleading in several ways. It may not be what you think it is, it should not be used in isolation, and the report format can make you see things that aren’t there. Lets start with the number itself: the Count of Sessions number (actually it is a dimension, and as such it is a text string or label) comes from a cookie in the user’s browser — it keeps track of how many times the user has been to your site. On their first visit, it is a 1, on their second visit it is a 2, and so on. 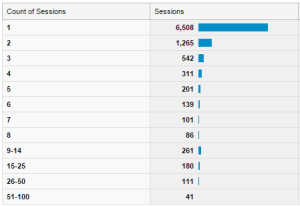 In the example shown, this means that 6,508 users had their first session on the site during the period. If you checked the New vs Returning visitors report, you would see the numbers match the New Visitors number. All good. But this begs a clarification: it does NOT mean that 6,508 users had only 1 session on the site; it means they had their FIRST session. They may have visited 5 times during the period, and they would be represented in the chart for Count of Sessions 1, 2, 3, 4 and 5 because their cookie would increment for each visit. There could be a huge amount of duplication in the report….or none. How much duplication depends on another aspect of your site, and this is why you should not use the Frequency/Count of Sessions report all by itself. Quick check: if the total number of sessions for the period is almost equal to the number of users, you can look closer at the distribution. Another problem with the report is visual: there usually appears to be a little bump in the higher numbers (9 and above). It gives you the impression that you have a group of people that come back over and over again, like loyal followers. 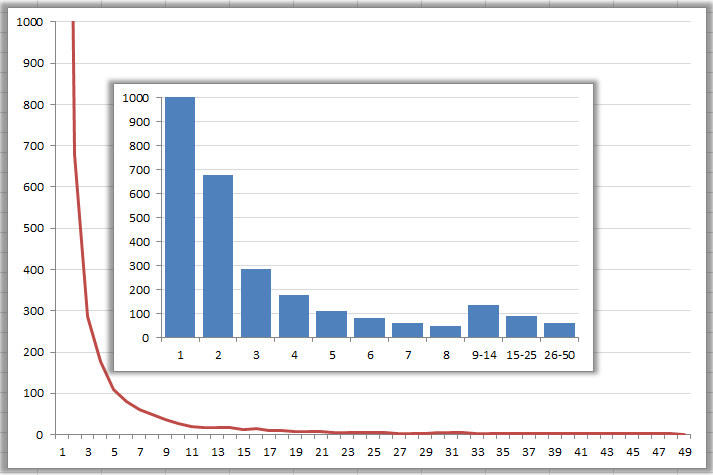 In reality, this is the result of the uneven grouping of multiple data points. The group 9-14 includes numbers 9, 10, 11, 12, 13 and 14, and while it totals to 261, that averages to about 43 per digit, half of the previous (8 sessions) count of 86. The next grouping includes even more numbers, and the next even more again. That makes the bottom of the chart confusing and very misleading! The distribution is usually a classic “long tail” curve, diminishing slowly to zero, but they bunch up the higher numbers which makes the distribution look like there is something there to look at. Worse: if there is, you may discount it because you expected something anyways. The confusion is compounded further when you consider that the numbers may include a lot of duplication: users that visit over and over and over again will show up multiple times (in 9, 10, 11, 12, 13 and 14), making the aggregated number even higher. Remember, the metric displayed is Sessions, not Users. Google Analytics reports don’t always show you what you might think, and you should never use individual measures in isolation. Finally, look carefully at the numbers and how they are presented before you jump to conclusions. Analytics may be simple to produce, but they can be hard to interpret properly.